Harmonica workshop at the Old Settlers Music Festival, Dripping Springs, Tx. (April 2001) --photo by Jim Dirden. The band backing me is the High Stakes Rollers (Austin, Tx.). I play a great deal of bluegrass music, but I also play some jazz, blues, country, Irish, classical, etc., as well. To me, my harmonica is essentially a fiddle with reeds, instead of strings and a bow. I have been playing fiddle-style harmonica for 30 years or so and am interested in sharing information with other players with similar interests. I am a member of the International Bluegrass Music Association (IBMA), the Central Texas Bluegrass Association (CTBA), the Bay Area Bluegrass Association (BABA), Austin Friends of Traditional Music, the Austin Chapter of the Harmonica Organization of Texas (HOOT), and the Society for the Preservation and Advancement of the Harmonica (SPAH). I am one of the songwriters of American Heritage, and I currently play for RedEye, Manchaca AllStars, the Blazing Bows, and K. R. Wood. I also occasionally play for anyone else who desires my harmonica talents, my vocal harmony talents, or my talents with the upright bass, mandolin, or guitar. Jim Stricklan asked me to help him out at his gig at Hill's Cafe on Jan. 20th, 2007. If you weren't there, you missed a show! Standing room only! Check out the workshops and festivals listed below and the schedules for the Manchaca Allstars (for whom I sing harmony, play harmonica, and play bass) and the Blazing Bows (who I back with guitar or bass). The Blazing Bows are a group of children who study Suzuki violin method, coupled with Texas/bluegrass fiddling, and perform occasionally for festivals, nursing homes, schools, and such. The Old Settlers Music Festival (Salt Lick Pavillion, Austin, Tx. ), will be getting ready for the next festival (April, 2007). For the last 7 years I have given a harmonica workshop at this festival (often focusing on bluegrass harmonica or working with one of the festival performers) that has been very well received. 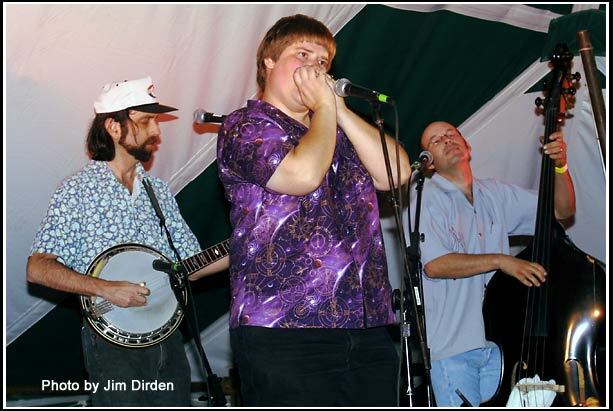 In 2006, Jimi Lee and Lonnie Joe Howell (a Nashville session musician) joined me for this workshop, sharing their points of view of the harmonica ranging from the world of blues to country blues. If you are interested in learning about playing the harmonica, then put this festival, and this workshop, on your schedule. The festival line-up every year is exceptional. Plenty of bluegrass. Plenty of other stuff. Included in the festival schedule is a young musicians contest. They have four simultaneous stages to keep you busy all day long and through most of the night. Check out http://www.oldsettlersmusicfest.org/ for more information. The camp also teaches banjo, mandolin, guitar, fiddle, bass, mountain dulcimer, hammered dulcimer, and voice -- all taught by consumate pros with many years of experience. The learning atmosphere is relaxed and conducive to learning, practice, and experimentation. The camp itself is economical: $325 for instruction/$200 for room and board for 5 days. (Alternate room and board arrangements are available.) [I can tell you from experience that their rooms are very comfortable!] Check www.hcamp.org for more information on the camp, its instructors, and accommodations. The Society for the Preservation and Advancement of the Harmonica (SPAH)convention in Denver, Co., was fantastic. The next one will be in Milwaukee. Hope to see you there! Guess what we are going to have again at the harmonica convention: a bluegrass "teach-in" table and bluegrass jam sessions! Last year, both the bluegrass table and the bluegrass jam were popular, so they want to do it again. We had a variety of notable players visit the jam, including Jason Ricci (who said: "The word is, this is the 'happenin' jam. "), Lonnie Joe Howell (who can keep rhythm while playing strong leads in a rack), P. T. Gazell, Robert Bonfiglio, Clay Kirkland, and many more from all genres of music -- including some bass and chord harmonica players who were learning to apply their skills to a music that is primarily dominated by stringed rhythm musicians. We had a blast last year. I expect that we will again this year! The "Teach-In" is a multi-day opportunity at the convention to study one on one with someone who knows a great deal more than you on a particular aspect of playing or working with equipment. The "Teach-In" teachers are all accomplished and have certain skills and knowledge that they would love to pass on to anyone who is interested. Jimi Lee's hallway jam sessions are always great, too. Everyone gets their chance to try the tune and the music varies from the 12 bar blues to some old jazz standards, and may include a country/bluegrass tune. Jimi is a wonderfully talented musician who is always interested in helping others learn or challenging them to go further. The shows and seminars are always great. The jams are great. And everyone is generally interested in helping each other learn some new aspect of the instrument or improve a skill. Check the SPAH website for more info on this and future harmonica conventions and on the organization itself. The Manchaca AllStars, after 20 years, has finally produced a CD of the good music enjoyed by the locals at the Manchaca Firehall on Friday nights. This CD was recorded live, just as if we were enjoying the Firehall's fried catfish under the pavillions at the Clarence Vogel Community Center. On this CD, you will find songs and tunes that have become favorites of our audiences over the years. And, thanks to the contribution of Doug Taylor's bass skills, you will also find my harmonica doing its thing on many of the songs. This will be one of the few CD's you will ever find with a version of "Draggin' the Bow" on harmonica that holds its own against the fiddle. If you are interested in a Manchaca AllStar CD ($10), write us at manchacaallstars@email.com. We will be proud as punch to set you up with one. K. R. Wood brings the history of Texas to life with his CDs, songs, and performances (complete with a chuckwagon). Visit his website to learn more about him and his music and to check out his historical "Fathers of Texas Series" of CDs. The series includes: "The Fathers of Texas", "The Crockett Chronicles", "Los Texanos", and some cowboy CDs dedicated to the cattle drive years, the "Camp Cookie" CDs. "Camp Cookie Christmas" with Petey and the Prairie Dogs is a great choice for a Christmas gift. (I got a chance to help out with this CD, too, and it is a lot of fun. I am not sure, but I may also be one of the Prairie Dogs. If I am not, I would sure liked to have been. They turned out unbelieveably cute on the CD.) Check out K. R. Wood's website and see what trouble this cowboy is getting into. Jim Strickland, a talented songwriter, has been pleasing audiences for many years. His gospel CD was stellar and was followed quickly by a compilation CD of some of his favorite songwriters (himself included). On these CD's, he also used the talents of some of his favorite local musicians (me included). I am glad that he got me involved with these projects, because they turned out wonderfully. If you want to see what everyone is all up about, sample or order his CD's at http://www.frontroommusic.com/. The Central Texas Bluegrass Association (CTBA) is proud to present their CDs sampling some of central Texas' finest bluegrass bands. These CDs feature top-knotch bluegrass music from deep within the heart of Texas. Both economical and special, these CDs boast over 20 tunes each (both original and traditional) from a large number of bands and only cost $10 a piece. (Every dollar is money in support of bluegrass in central Texas and the CTBA.) If you would like to hear central Texas' finest bluegrass, order your CDs at www.centraltexasbluegrass.org/cdproject.html. If you are interested in some of my bluegrass harmonica, get the second CD. I play and sing on several cuts with both the Ledbetters (from San Antonio, Tx.) and the Manchaca All Stars (Manchaca/Austin, Tx.). The Ledbetters also put one of American Heritage's (my songwriting group) songs on the CD, as well. The High Stakes Rollers, a skilled and talented bluegrass variety group based in Austin, Tx., have produced a CD of their live performances. On that CD, I am honored with an appearance playing harmonica on the swing/bluegrass tune "Little Rock Getaway". To get your own CD for $10, email Eddie Collins. More information and materials are available from Eddie Collins at http://www.eddiecollins.biz/. For those who would like to try their hand at playing fiddle tunes, the following links will provide some harmonica tab for you. There is a legend at the bottom of the tab to help you read it. The tab has a pseudo-time set-up so that if you play the notes and spaces correctly, you should have approximately the correct time on each note. (See the legend at the bottom of the page.) A couple of these tunes are also played for you in the above music links, but the version on paper may be simpler than what was recorded. Or you could just run the harmonica scale from 4 blow to 7 blow and back, then start the scale on the next note and run that one up an octave. If you keep running these scales, you will wander through the modes in which the harmonica can play naturally. If you are a harmonica player in Texas, then you should check out the Harmonica Organization of Texas website for the chapter of the club that may be in your area. HOOT now has chapters in Dallas, Austin, Houston, Amarillo, West Texas (Midland), and San Antonio. For a state this size, it is pretty hard to get in touch with other people who share your interests, especially if that interest is the harmonica. So check them out and get in touch! The San Antonio chapter of HOOT is going good now, but would still like to have you with them. If you are a harmonica player in the San Antonio area, you should check these go-getters out. They have plans for the up-coming year and a wide-range of experience to draw on for some of their meeting topics. For more information on the local club, check HOOT's website or contact Bob "The Captain" Boyd at (210)494-1118 or Betty Welch. If you are a harmonica player in the Houston area (Tx. ), then this may be the club for you! The Houston Chapter of HOOT meets every 3rd Wednesday at 7:30pm. in Room E252 East, Tomball Community College (30555 Tomball Parkway, Tomball, Tx.). For more information, check out the Houston chapter of HOOT at http://www.hoottexas.com/ or contact Gary Johnson. If you are a harmonica player in the Austin area (Tx. ), then you ought to drop by a meeting and say "Hello" -- maybe even give us thought or two or a tune off of your harp. Our meetings include club business and discussions, but often also include a workshop or lesson of some sort and/or a small jam. We are a small group, but we are talented and growing. We meet every 2nd Tuesday of the month in the upper meeting room at Artz Ribhouse (2330 S. Lamar) -- located at the corner of South Lamar and Bluebonnet. To check the next meeting date or see what other harmonica related shows or activities are going on, go to http://www.hoottexas.com/. The Austin HOOT club library is popular and growing. It contains recorded and written harmonica related materials for the use of our members which was donated/loaned to the club by club members -- one more perk for the faithful membership. If you love blues and are in the San Antonio area (Tx. ), then the San Antonio Blues Society is for you! It is off to a flying start, but it needs the help of San Antonio blues fans. For more information, check out their site at http://www.sanantonioblues.com/. They will be glad to talk to you. Visit the webpage of harmonica legend, Lonnie Glosson. [Link is temporarily out of action.] Known as the "talkin' harmonica man", he fascinated audiences with his harmonica from the stage and over the radio until the age of 92 (a testament to the healthful benefits of playing the harmonica and of playing music in general). From the 1920's to the 1950's he traveled the country playing the harmonica in shows and on the radio, including a bit on WLS Radio (Chicago) and the Grand Ol' Opry. He even found himself on the television show "Hee Haw" in the 1970's. With his harmonica playing partner, Wayne Raney, he wrote the song, "Why Don't You Haul Off and Love Me." Lonnie's composition "Matthew 24" has been recorded by both Kitty Wells and George Jones. Recordings of Lonnie's music, and the music of harmonica legends Deford Bailey and Wayne Raney, can be obtained from Lonnie's website at http://www.lonnieglosson.com/ for a very reasonable price. Many of these recordings are rare and are a must have for any avid bluegrass/country blues harmonica player. Add some to your collection! Camp Bluegrass & Swing Camp -- July 22 - 27, 2007!! With instruction, room, and board totaling around $550, you can take an economical vacation for a week and learn about your favorite music or instrument at the same time! These camps are worth the trip! Try them out! Note: While bluegrass harmonica is not one of the "official" study topics offered at Camp Bluegrass, when I am there, I always like to meet and trade information with fellow harmonica players when I find them -- and there usually are a couple. If you want to ask them to include harmonica in their week of instruction, email them. An email address is provided for just such things on their website. They always encourage and listen to ideas, suggestions, requests, and feedback. However, you should also check out a similar camp, done by many of the same people a month earlier (in June): the Hill Country Acoustic Music Camp which will take place on the Schreiner University campus in Kerrville, Tx. That camp has scheduled a harmonica class in the past and may once again. It operates similarly to Camp Bluegrass and utilizes many of the same instructors, but they also include instruction on many instruments not typically covered in a bluegrass camp, like the mountain dulcimer, hammered dulcimer, fingerstyle guitar, harmonica, etc. Check their website out to see if it is the camp for you instead. A list of the bands scheduled for the "Firehall" can be found at http://manchacaallstars.tripod.com/id13.html. The fish fry and music occurs every Friday night with a different band (just to keep things interesting). There is no cover charge for this event, and there is plenty of space for kids to run around, and even a horse shoe/washer course out behind the pavillion. Also catch the Manchaca AllStars on the CTBA band samplers currently available from the Central Texas Bluegrass Association. And the new Manchaca AllStar Live CD has been released. After 20 years of playing together, we finally decided to take a chance and record ourselves! Order it from us at manchacaallstars@email.com. visit Lonnie Glosson's official website (This 93 year old legend could really play!!) This link is temporarily out of order. A new Lonnie Glosson website will be forthcoming. Old Settler's Music Festival -- Gearing up for the upcoming festival. Harmonica workshop! Check out the stellar line-up of talent -- good for all bluegrass and acoustic music fans!! Hill Country Acoustic Music Camp -- Schreiner University campus, Kerrville, Tx. -- Spend a week for a reasonable price learning from the professionals about your favorite music and how to play it. Camp Bluegrass/Camp Swing -- South Plains College, Levelland, Tx. -- Spend a week for a reasonable price learning from the professionals about your favorite music and how to play it. Blazing Bows website -- Mary Hattersley's Blazing Bows are kids trained in the Suzuki violin method and Texas/bluegrass fiddling (simultaneously) and who perform in various places, including schools and nursing/retirement homes.